4.3 out of 5 based on 114 bloggers and 29 commenters. 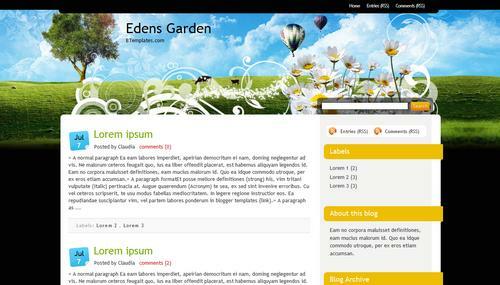 Edens Garden is a free blogger template with 2 columns, right sidebar, fresh look, rounded corners and vectorial elements. Excellent template for blogs about to write a diary or nature. Hi, thanks for the template. I love it for this season! It fits. However, I do need some help in regards with the “undefined” date. I tried changing it in the format/settings, etc. area, but that is not working. PLEASE let me know what else I can do, or if I am doing it correcting in making sure the date shows up as it is in your template: “Jul 7”. Thank you! Hi i tried putting my flickr id but i cant, i dont find the code to put my id! HELP PLEASE! Can you tell me what to adjust to turn off the summarized post entries? Love the template but need full posts to show. I agree with Melissa, i would also like to know how to turn off the summarised posts. Ok i found a section over in the html where the code mentioned summarising posts when i delete this section though, my most recent post shows up in full but overlaps over the other still summarised post? I replaced my standard blogger.com template with this one. I really like except for the fact that it doesn’t seem to support an Adsense Widget in the sidebar. I haven’t tried adding Adsense manually as a “HTML Widget” though. Perhaps it works that way. In any case, great template! Nice template. Except that I prefer to display full post rather than the summary. Any idea how to fix it? Did anyone figure out how to get our full posts to show? I want this layout, but if I can’t fix that then I am going to get another layout. Is there a way to use a photostream from gallery or another source besides flickr? I don’t use a flickr account and know I wouldn’t keep it updated. I’d prefer to link it from facebook or my gallery account, etc. Otherwise I love the layout! thanks for the template. I love farming, I write a blog for the advancement of agriculture in my country and I try to help farmers and agricultural extension through my blog. I have not found the right template for my blog, which is easily accessible, interesting, and certainly can help farmers in my country, can you help me? Hi all! I cant set up the date in the blue field, it always write: undefined! Pls help me, i try to set timestamp to current date, how Claudia writed before, but cant do it. Pls help, how can i set the correct date, ty. Go Settings/Formatting/Timestamp format -> Monday, April 19, 2010. Thank you Claudia, its works! I cant try this date format before, but it isnt enough, need to set the timestamp and date header at a same format. But now it works, ty another! Thank you Claudia! I was getting so frustrated with the whole ‘undefined’ thing till I read what you posted– Yahoo it works! I can’t for the life of me figure out why, when I click download, it wont open properly. How do I get this for my blog? I’m so confused. I love your template and I don’t mind the summaries but the photos with each summary are distorted. How do I fix this? Hi- I really love this template- but I want to remove the auto summary thing as it makes the posts look really messy. Help me please? My page links do not work. I can click on the page but it only shows a summary–all my videos and links are gone. Please help!